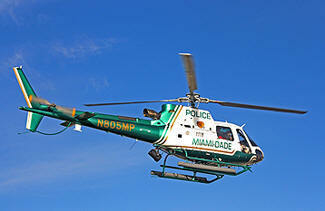 December 11, 2009 - American Eurocopter delivered another AS350B3 helicopter to the Miami-Dade Police Department’s (MDPD) Aviation Unit. This is the second of four AS350B3s that have been ordered. The aircraft will join the department’s Special Patrol Bureau’s Aviation Unit that includes a fleet of rotary and fixed wing aircraft. The first AS350B3 was delivered last December and the MDPD will continue to receive helicopters at a rate of one a year over the next two years. The AS350B3 provides unparalleled visibility and, with its proven law enforcement integration, has become the platform of choice for the law enforcement community. It is a powerful and reliable aircraft that provides unmatched performance, the flexibility for extensive mission equipment options and the added safety of its multiple-redundancy system design. As with many airborne law enforcement organizations throughout the country, the mission platform of the MDPD Aviation Unit has evolved to support additional initiatives. In the Miami-Dade county and surrounding region, these include Homeland Security initiatives as well as port security and coverage for key county infrastructures. The AS350B3 is a single-engine helicopter known for its high-performance. It is equipped with a powerful 847 shp Turbomeca Arriel 2B1 engine. The AS350 family has established itself as the preferred platform for U.S. law enforcement agencies and it serves with 75 agencies across the nation, including major federal operators such as the Federal Bureau of Investigation (FBI), the Drug Enforcement Agency (DEA) and the Department of Justice (DOJ). “Our first AS350B3 has proven itself to be an indispensable part of our fleet and we are looking forward to working this second aircraft into our mission schedule,” continued Turpin. American Eurocopter is a helicopter manufacturer that produces, markets, sells and supports the broadest range of civil and para-public helicopters offered by any manufacturer in the United States. The company is a subsidiary of EADS North America Holdings, the North American operations of EADS, a global leader in aerospace, defense and related services, and is an affiliate of Eurocopter, the largest helicopter manufacturer in the world. American Eurocopter’s product line represents the most cost-effective, technologically-advanced helicopters, ranging from light single to heavy twin, serving all markets and missions. Company headquarters and main facilities are located in Grand Prairie, TX, with a large manufacturing and production facility in Columbus, MS, that produces the UH-72A for the U.S. Army’s Light Utility Helicopter program.